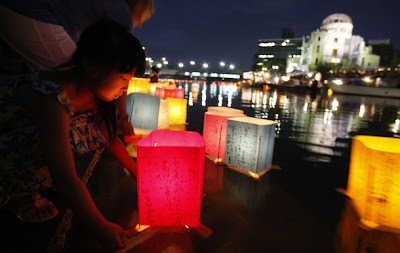 Whispers in the Loggia: "The Path to Zero"
To commemorate the 64th anniversary of the first atomic bombing at Hiroshima, lanterns were released along the Motoyasu River as night fell, the city's Peace Memorial looming in the background. In the run-up to today's observances, a significant address on nuclear non-proliferation and disarmament was given last week by Archbishop Edwin O'Brien of Baltimore. A longtime military man -- the native New Yorker spent years as an Army chaplain before a decade's service as pastor-in-chief to the 1.5 million US Catholics in uniform -- the senior prelate's call for a "Path to Zero" closed a daylong conference held at the Strategic Command in Omaha.